Top left: 1400 Broadway, c. 1931. Architecture and Building, April 1931. Courtesy of Avery Architectural and Fine Arts Library, Columbia University in the City of New York. Top right: Bricken Textile Building, 530 Seventh Avenue, 1930. Collection of The Skyscraper Museum. Bottom left: Bricken Casino Building lobby, c. 1931. Library of Congress. Bottom right: Pattullo, Inc. showroom, Northwest Corner of 39th Street and 7th Avenue. The Work of George & Edward Blum, Architects, 1935. Collection of The Skyscraper Museum. The jobbers, with their offices and showrooms, occupied the most prestigious buildings located along Broadway and Seventh Avenue. The latter address became so iconic that the entire Garment District came to be known simply as "Seventh Avenue." Zoning shaped the character of the two major throughfares, limiting industrial use to only 25% and permitting taller buildings with setbacks starting at a higher floor than on the narrower side streets. Land prices were also high because these large buildings were convenient to the subway lines running beneath both streets, as well as for their proximity to Pennsylvania Station. Developers, such as Abraham Lefcourt, Louis Adler, and Abraham Bricken erected enormous new structures, many specifically marketed to jobbers in a particular sector of the industry. One building might have a high concentration of firms specializing in high-end dresses, while another had companies that manufactured bargain-priced apparel. This concentration of jobbers made it easy for out-of-town buyers who came to New York on brief trips to visit as many companies as possible. Developers planned the showroom and offices buildings for flexibility, with floors that could easily be subdivided into offices, stockrooms, showrooms, and work areas. They frequently spent extra for high-quality lobbies that would impress prospective tenants and buyers. 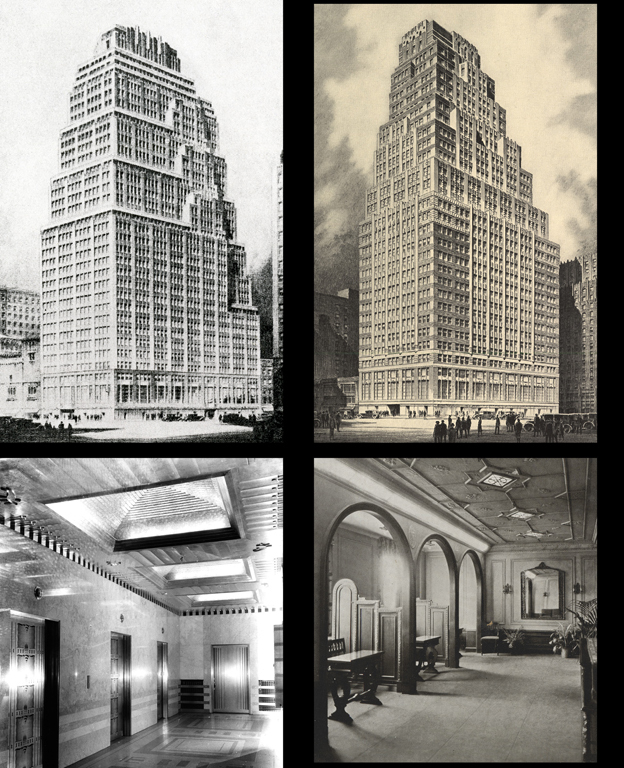 Expensive marbles; custom-designed entrances; bronze elevator doors, directories, and grilles; mosaic ceilings; and innovative lighting graced the lobbies of the finest showroom buildings.